Rolling out dough has never been easier than with this Ateco 20175 20" tapered maple wood french rolling pin! For ease of use, this pin features tapered ends and a smooth finish that is both easy to clean and comfortable on your hands and wrists. 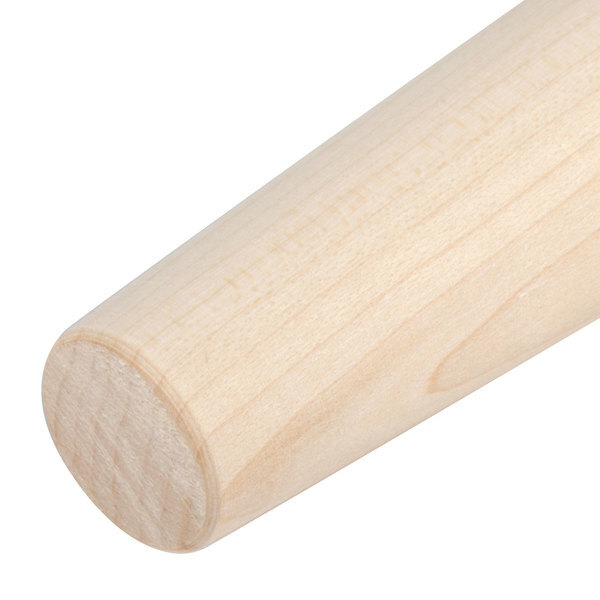 Constructed of solid rock maple wood, this rolling pin includes a one-piece design. Without cumbersome handles getting in the way, you can firmly press down on dough as you work to roll it out. A durable addition to your kitchen, you can roll out pie crusts, cookie dough, and puff pastry to make customer favorites. Ideal for bakeries, pastry shops, and cafes, this rolling pin is an excellent addition to your kitchen tools. Very sturdy and good quality of wood. The only minus is that it is a bit thin, but works fine and is lightweight. Worth the price! Beautiful rolling pin that does everything I've asked. The taper is nice for the times you want that feature. Also, the price is quite affordable. French rolling pins are meant to give lots of fine control and this one works perfectly. Since it doesn't weigh much, it's also easy to maneuver around for any task where you need something solid, such as adding extra pressure to a spatula when smashing smash burgers. We have used these during our cooking classes. Students have found them easy to use and easy to clean. The only downside is finding a good storage place for the rolling pins. This is my favorite rolling pin. It feels good to use and it is beautifully constructed. Webstaurant has the best price for this rolling pin! The maple wood makes for a nice, light pin for rolling dough for smaller pastries and other treats. Ateco products always fail to disappoint me! I like having a French rolling pin, rather than the standard kind with handles, but the quality of this one is only so-so. It splinters a bit, and also isn't actually excatly even, which makes it less reliable for things like rolling pie crust. This rolling pin allowed for ease of use when rolling out cookie dough. It's much better than the traditional rolling pins with handles. It take a bit to get used to it, but once you do you won't go back! Our baker's best friend! Once you get the hang of it the freedom and versatility of this rolling pin changed our world. 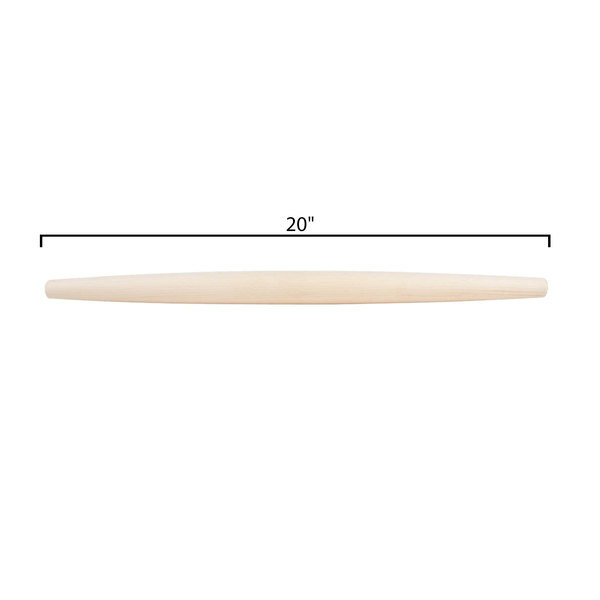 At 20 inches you may be scared off by the size but it is measured end to end while other rolling pins are measured across the rolling surface without measuring the handles, so it is a very manageable size. Definitely recommend this product. Really nice rolling pin to have for smaller jobs. Able to do a couple tricks and techniques that aren't able to with a standard rolling pin. Looks nice, smooth, and great tool to have for small kitchens. This rolling pin has a very smooth feel to it. It is very nice to work with. I have never had a tapered rolling pin before but it made working out the corners so much easier. 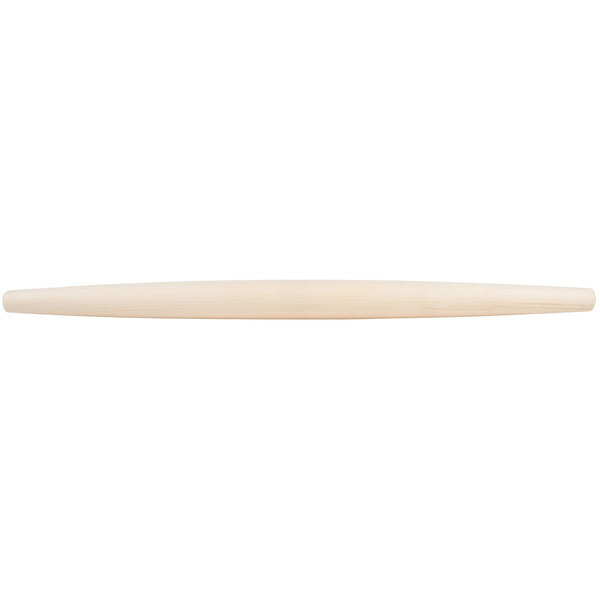 Though this one is quite thin, you'll never need another rolling pin if you have a tapered French one. The thing about traditional wooden rolling pins is that if the handle falls off, they are nearly impossible to repair. But with these French pins, you never have to worry about that kind of breakage; they're just so sturdy. This is a good rolling pin for the price. The circumference was a bit smaller than I expected. This is good for small batches of dough, not for large quantities. I love my new rolling pin! The wood is baby's-bottom soft, and the taper is absolutely perfect. Not so much that you over-flatten the center, just enough to make this rolling pin a dream to maneuver. If you're rolling out dough that's wider than the rolling pin, no more lines from the edges of the rolling pin! I look forward to rolling out dough now! This rolling pin is very nice to look at and I enjoy having it in my collection, however, for whatever reason, it's kind of hard for me to use. I added this pin to my order without very high expectations but absolutely love it! This has become my go to rolling pin, perfect weight and size for everything from cookies to delicate doughs. I love this rolling pin. It is great for rolling out any kind of dough whether it be for bread, pasta, or any other pastry. It's great. I like this rolling pin okay. It's oddly shaped and hard for me to use for some reason but it works. Remember to always flour it before rolling dough to prevent it from sticking. I didn't realize how much easier it is to use than my short, handled rolling pin. The long size means I can roll out the dough in fewer strokes, which gives me a more even result. I'm SO glad I found this rolling pin and what a great price!